The recent post about a Porsche 911 showing off its algae-coated exterior may be the sign of a new trend: preserving vegetation on the exteriors of long-idled cars. 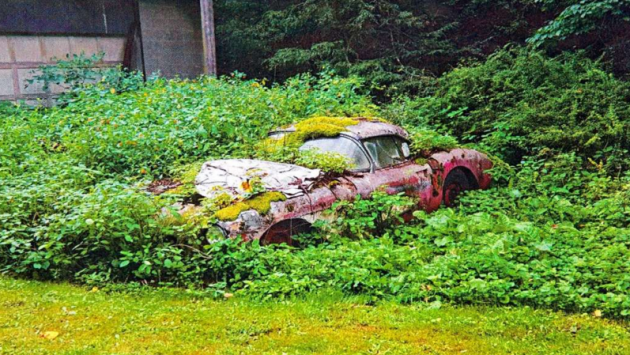 This 1956 Corvette is seen where it was parked for years next to a garage in Pennsylvania. Supposedly, many attempts were made to buy the car, all of them unsuccessful until last August. 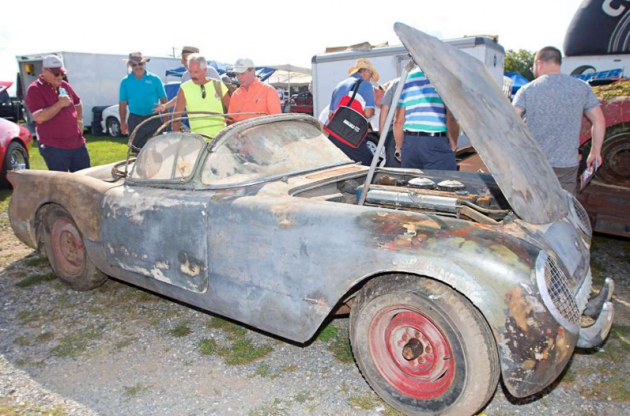 It, and a slightly-less-decrepit ’54 model, were purchased and shown off at 2017 Corvettes at Carlisle event. Find the full story via the Hot Rod Network here on MSN. Thanks to Barn Finds reader Michael for the find. Both cars were taken to the show for the purpose of display, and the owner quickly found his weathered C1 Corvettes were the star of the show. His wife even “watered” the moss growing on the ’56 car to ensure it looked as lush as it did when first removed! The hood wasn’t even opened to see what motor was inside for fear of disturbing the years’ of accumulated moss. Both cars did sell at the show, with the ’56 earning $10K and the ’54 in the mid $20s. The Venetian Red / Polo White ’56 car was parked in 1972 and didn’t move again until last August when the owner was persuaded to sell it as part of a three-car deal. Supposedly, the new owner of this car is going to keep it in its current state for a little while longer. I get it – the appearance certainly is memorable – but to own something simply for the gasps and laughs it provides is akin to the 1925 Bugatti Type 22 Brescia Roadster that sat at the bottom of a lake for years and still sold for a cool $370,000. The ’54 is already slated for a full restoration, and I wonder if it’s even worth trying to resuscitate the ’56 at this point. What do you think: is there enough desire for these early Corvettes that it may make sense to restore even a basketcase like this one? The earlier car was slightly more complete, but the buyer did have to re-assemble it on site before moving the car as it had been previously broken down for a restoration that stalled. It originally had a similar color combination, this time with a Polo White exterior and Sportsman Red interior. Both of these cars would be stunning garage mates when complete, and this story goes to show you that gearheads are among some of the most persistent people on earth: both in the pursuit, and the prolonged possession, of classic sports cars. I wish I had such valuable lawn ornaments. Thanks for your colorful input. Yes, wash off the old ivy and look in to the engine compartment . Enough already !! But it seems to have worked well for the buyer who resold it….Good for them. It only takes the desire of one person to make it worth restoring, it doesn’t matter what anyone else may think. It may not make sense (cents! ), financially. The MSN article and displays in its current condition at car shows seem like the first steps in a marketing campaign. Rule #1 create buzz by making your barn find internet famous before listing it for sale. It’s a business decision, and a smart one. People will pay a premium to be associated with anything that has reached any form of celebrity status. You definitely got that right. Look at these as an investment that you can watch grow in the literal sense. Where there’s money, there’s hope! Hope is a good thing, maybe the best thing. Definitely zero greenhouse gas emissions. Most were not valuable when parked. They were worn out and often rusted to a point where it didn’t make financial sense to repair or rebuild them. Only decades later they became valuable. A crystal ball would be nice, but they don’t exist. The same thing could be said about Amazon and Apple stock, real estate in San Francisco almost anything collectible. Some people actually were did buy and hold, most just talk about it. Wow, those cars sold for that?? I’m going on a car hunt tommorow in North Carolina. Early Easter Egg hunt time, look for the rotten eggs…err cars!! 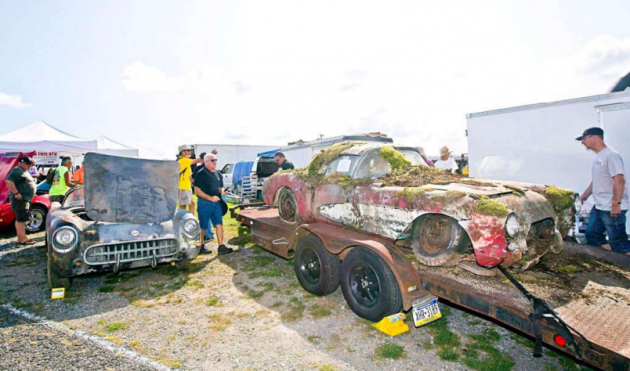 Here we go again…..our weekly dose of Vettes left out to rot. Part of the allure of the car hobby is the thrill of the hunt. But in this case, much like any other hunt, once you’ve bagged your prey, all your left with is a carcass. Nothing says redneck more than car in the yard and being Corvettes make you the king or queen of your double wide trailer. We have been seeing some barn find Chia Pets lately. This happens WAY too often. Some old fart has these sort of cars and will not sell. Seen too many episodes of American Pickers where some old geezer with one foot over the grave and the other foot on a banana peel is like “Noooooo……..I don’t think I can let that go. I’m gonna fix that up.” Yeah, sure you are, gramps. And not just cars, but everything. Their house/ garage can be crammed to the rafters with stuff, and they won’t sell. But a very few years down the road they will be dead and their family will sell what they can for ten cents on the dollar and will be using a backhoe to bury the rest of grandpa’s junk in a hole at the back of the property considerably bigger than the one they dropped him into. I just can’t comprehend it. What is WRONG with people, to let this happen!!!? It would take a miracle for the ’56 to ever be on the road again, or a boatload of cash. Will the car be? Hard to say – but bet the VIN will be. $10k is about right for that. It’s absurd, but some Corvette enthusiast will jump on these and make them live again. I would not. The red neck analogy doesn’t work here or with most of these barn and garden finds. Many of the people that owned most of these cars, bought them new or nearly new. They were and still are in many cases successful people, who are just a bit strange. What we are seeing is really a form of hoarding. Despite the fact that many hoarders’ homes are piled with junk and garbage, the disorder is associated with perfectionism, which is tied to a fear of making the wrong decision. They are afraid to sell anything they own, because they don’t want to see the buyer make an excessive profit on the item. They would rather see it rot than suffer it indignity of making a mistake and having to live with it. I have heard the comment made over and over again on this site about the guy they know who lets a nice car rot on his front lawn or garage and refuses their offers to purchase it over and over again. Along with cars, I also buy a lot of antiques and art and I see the same thing happening in that area. You have to try to get into their head to get a deal done. If that doesn’t work and you realize you are beating a bead horse just walk away. If you are pissed off, you can always throw the hand grenade and make a ridiculous final offer that you have no intention of committing to just to screw with his mind. While I do enjoy and appreciate this site, and I thank it’s producer, the fad has gotten out of hand! 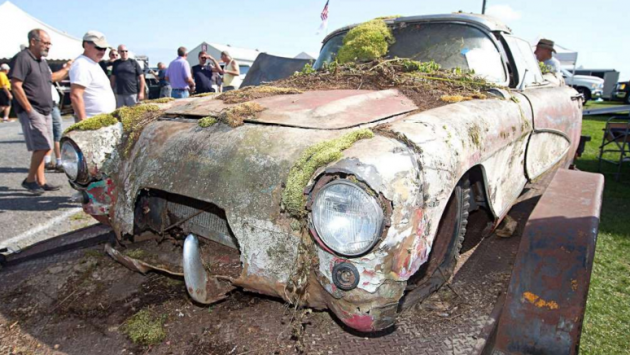 A barn find was exciting because an unusual, potentially valuable, or rare car in fair to good condition was found at a bargain price. Moss, pigeon crap, inches of dust and acres of rust were not the main attractions. The buyer would take the car home, clean it up, assess it’s condition and put together a plan to recommission or restore it. Now the buyer puts it on the Net, drags it to a show, and is careful not to disturb any of it’s “archaeological” patina before they flip it. I guess that I should drag my old car under a tree full of nesting crows, spray it with acid, then throw shovelfuls of dirt on it. When’s the next big show? AND they were ‘less disable’ vehicles (“early broncos”). motivated buyers – can make it happen easily. It’s been enjoyable due to: no interest in pressure by others, or huge financial return and… interest in promoting the brand in all it’s varied forms. When at that place it all doesn’t really matter so the sport/hobby/vehicle, etc reigns paramount. And that’s just as it should be. Those girls have been rode hard and put up wet and dirty way too many times.